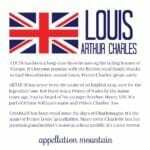 Louis Arthur Charles is the name of the newest member of the British Royal Family. Our Baby Name of the Day celebrates his arrival. The Germanic Chlodovech doesn’t seem terribly promising, but it’s the forerunner of many a name worn by notables over the years. It comes from elements meaning famous and battle, so that’s a strong meaning. There’s Clovis, King of the Franks, way back in the 400s, via the Latinized form Clodovicus. Ludwig – as in van Beethoven and Wittgenstein – also evolved from the original, as did Ludovic and Aloysius. International forms like Luigi and Luis have long histories of use, too. But today it is two forms that stand out in English: Lewis, more common as a surname, and Louis. In the UK, things are a little different. It came into common use in the royal family fairly recently. That’s thanks to Prince Charles’ great-uncle, Lord Mountbatten. Break out your family trees. Born Prince Louis of Battenberg in 1917, he was the youngest child of Prince Louis of Battenberg and Princess Victoria of Hesse and by Rhine. Princess Victoria was a granddaughter of Queen Victoria, through her daughter, Princess Alice. So he was in the family from the first, technically Great-Uncle to Charles, but their relationship was much closer. It’s said they considered themselves honorary grandfather and grandson. No surprise that it’s part of Prince William’s full name: William Arthur Philip Louis. It’s Prince George’s second middle name, and now the given name of the newest prince. There’s also Lady Louise, daughter of Prince Edward and cousin to Will. But like any classic name, it’s been used far and wide. It’s particularly musical. There’s jazz great Armstrong, rock and roll innovator Reed, and, for the younger generation, One Direction alum turned solo artist Tomlinson. Factor in the surname, and there’s also Jerry Lee Lewis. Of course, both spellings lean literary. 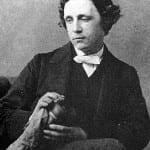 There are authors Sinclair and CS, plus Alice creator Lewis Carroll. Carroll’s pen name may have been inspired by his mother’s maiden name, Lutwidge, possibly yet another member of the extended family. Speaking of Carroll: as a university student, the future Duchess of Cambridge penned her honors dissertation on Lewis Carroll. It’s one of the reasons Alice stood out as such a favorite for a princess. Could it also explain her affection for this name? One hundred years ago, Louis was on top, a Top 50 choice through the 1930s. Then things changed, and the name retreated. Still, a long history of use makes this a flawless member of the classic boy names’ club. In the US, the name stood at #289 as of 2016, up slightly from prior years. Lewis trailed at #510, but again, that represents a climb from recent years. But it’s the Spanish Luis that beat them both. In the UK, the phonetic Louie is more popular than the formal version, though both are solid Top 100 choices. Lewis, too, makes the most recent Top 100, but it’s on the decline while the other forms surge. One reason for the spelling choices: pronunciation. In the US, both of the ‘s’ ending spellings are typically pronounced the same. My impression is that the British use Louie for both Lou- spellings, making Lewis the odd one out. Louis: The Lous are Coming! In the US, Louisa has recently returned to the US Top 1000, and Louise seems poised to do the same. And other Lou- and Lu- names, like Luna and Lucy, are white hot. The masculine forms of the name are climbing, too. We’ve been in love with Luke and Lucas for years, so that opens the door for the resurgence of all the Lou- names, too. Sandra Bullock used the name for her son in 2010, but there’s something a little different about a prince. After all, royal children remain in the spotlight steadily over the course of their entire lives. We hear the names, and we read them in headlines time and time again. 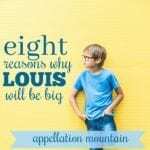 It’s easy to imagine parents warming to Louis over the next few years that hadn’t really considered the name previously. What do you think? Is Louis the next big thing? Louis Tomlinson of One Direction is a more recent musical reference, and I would imagine definitely put it on the name map in the UK if not also the US. I have a toddler Louis (pronounced Lou-ee), and I’m happy about the new royal baby name! 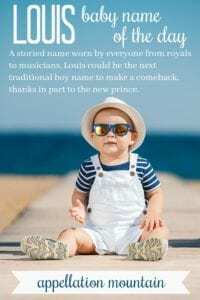 We love the name but the pronunciation/spelling is tricky, so I’m hopeful that the baby prince will help shift the common pronunciation in the U.S. more toward Lou-ee. I could see the name rising in popularity, but there are so many great Lou names that I doubt this one would skyrocket above the rest. I think it will be be a apart of the general Lou loving trend, but not the leader.